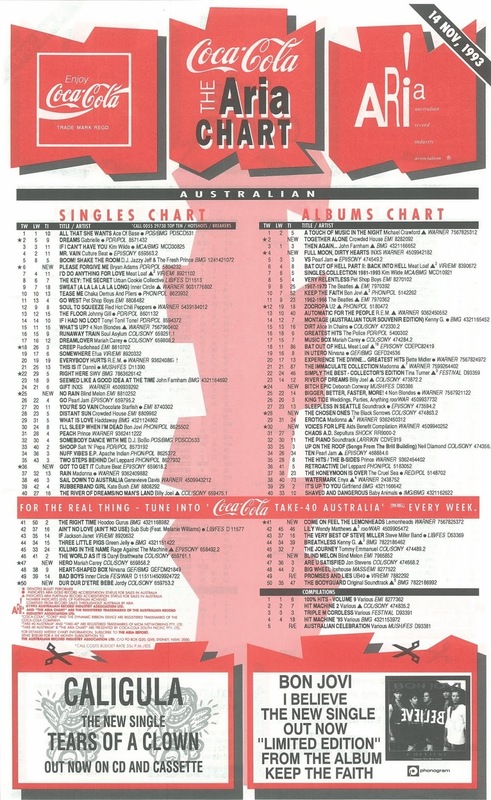 Cute kids are a sitcom and advertising staple, and this week in 1993, pre-teens were an integral part of two of the new entries on the ARIA singles chart. In one case, a 10-year-old girl provided the enduring visual image for a top 10 hit by a new US band. In the other, a five-year-old French kid entered the chart with his former European number 1 single. 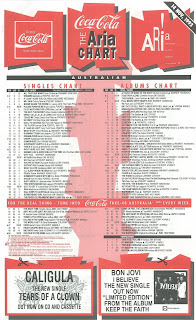 The number 1 single in Australia this week in 1993 was "All That She Wants" by Ace Of Base, which spent its second week on top. "The Floor" was still high on the chart after 15 weeks inside the top 50, but this next release from Provocative didn't repeat that success for Johnny Gill, who'd ultimately be a one-hit wonder. The two previous singles from "The Wedding Album" had made the top 20, but this just-as-good third track, which took a swipe at overly commercialised pop, bombed out. His last album had provided him with a long-awaited top 10 hit in the form of "Candy", but Iggy Pop had no such luck with anything from American Caesar, including this lead single. Seven years earlier, the radio DJ had reached the top 40 with "You Are Soul" (say the title quickly), but this track from Nice Legs Shame About The Fez couldn't do the same. Teen idols were nothing new on the charts, but this week in 1993, Australia welcomed a brand new type of chart star to the top 50: French toddler Jordy, with his former European number 1 - a song that was released a year earlier when he was just four-and-a-half. A fairly monotonous Eurodance track, "Dur Dur D'être Bébé" (French for "It's Tough To Be A Baby") was clearly only as successful as it was because of the novelty factor of someone who could barely speak performing on a single. Following this worldwide success, Jordy Lemoine released a few more songs (including a second chart-topper in France) before having the type of career and personal roller-coaster you'd expect for someone who became famous before he'd started school. Previous single "Dreamlover" had given a glimpse of the R&B direction Mariah Carey would head in as the '90s progressed, but Music Box's second single, "Hero", was about as big a belter as you could get. Interestingly, Mariah was not originally going to record the song herself. Co-written with regular collaboration Walter Afanasieff, it had been intended to be used in 1992 Dustin Hoffman film Hero and was going to be given to Gloria Estefan to perform. But when Sony head honcho and Mariah's then-fiancé Tommy Mottola heard a rough recording with Mariah singing, he insisted she keep it for herself. And so it went on to become one of her best-known songs and gave her a second number 7 hit in a row in Australia. "Mr Vain" was slowly making its way down from the top spot and was joined on the top 50 this week by follow-up "Got To Get It", another slice of Teutonic Eurodance that didn't deviate too far from the formula of their number 1 smash. There's not really much more to say about the song other than it was another of the year's best dance tracks from the act masterminded by DJ/producer Torsten Fenslau. 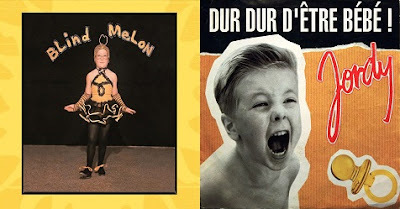 It's impossible to hear this song - the only hit for American five-piece Blind Melon - without picturing the music video featuring 10-year-old Heather DeLoach in a bee costume. The outfit was based on a photo of drummer Glenn Graham's sister taken in 1975 which was used for the cover of the band's self-titled debut album, with Heather bringing the picture to life in the video directed by Samuel Bayer, who'd also shot "Smells Like Teen Spirit". The song itself, which was written by bass player Brad Smith, might sound sunny, but it's actually about being depressed. The band released a second album in 1995 - the same year singer Shannon Hoon died of a drug overdose. Blasting straight into the top 10 was a brand new offering from the man who'd dominated the singles and albums charts a couple of years earlier with the behemoth "(Everything I Do) I Do It For You" from Waking Up The Neighbours. Having been landing international hits for a decade, Bryan Adams had earned himself a greatest hits collection and "Please Forgive Me" was the obligatory new track contained on So Far So Good. A classic Bryan Adams ballad, the song bored me to tears. Tens of thousands of Australians disagreed, sending it quickly to number 1. Next week: the ARIA chart debut of a dance act with a big-voiced (and -haired) singer... although we had heard her perform on another track four years previously. You weren't the only one bored to tears hearing that Bryan Adams song! That guy was really wearing out his welcome on our charts as far as I was concerned. Take 40 Australia used to play the English version of the Jordy song, as opposed to the French version as in the video linked above. Interesting that they recorded two versions, and maybe more (how many others were recorded for other Euro markets I wonder?). Doug Mulray in the top 100. Come on Australia. You're better than this. Jordy certainly was an interesting chart appearance. I caught it as a new release video on rage some weeks prior, but didn't expect it to chart. Pete is right - Take 40 Australia used to air the English version (the only place I heard it). I love the kind of 'melancholic dance' music that is 'Got To Get It'. I hated 'Please Forgive Me' at the time, but can now handle it in small doses. There is something very off-putting though about the way he sings the title, when the chorus starts. It's not as bad in the belting part. Interesting backstory about "Hero" that I hadn't heard before. It's a great song, and one of the best instances of Mariah Carey's voice when it was at its absolute best in the 1990-94 era. I remember the Bryan Adams song "Please Forgive Me" vying with his trio (with Sting and Rod Stewart) on the song "All For Love" (from the Three Musketeers movie) for #1 early in the new year of 1994. Both made the chart summit as Bryan's second and third chart-toppers, but Australia hadn't quite tired of his wares yet, since the following year in 1995 he had another movie tie-in #1 hit with "Have You Ever Really Loved A Woman".